"I grew up in a farm between Walnut Grove and Storden, Minnesota, we were farm people. I was brought up with discipline, I learned how to work hard; it was just expected of us," says Thorsness. 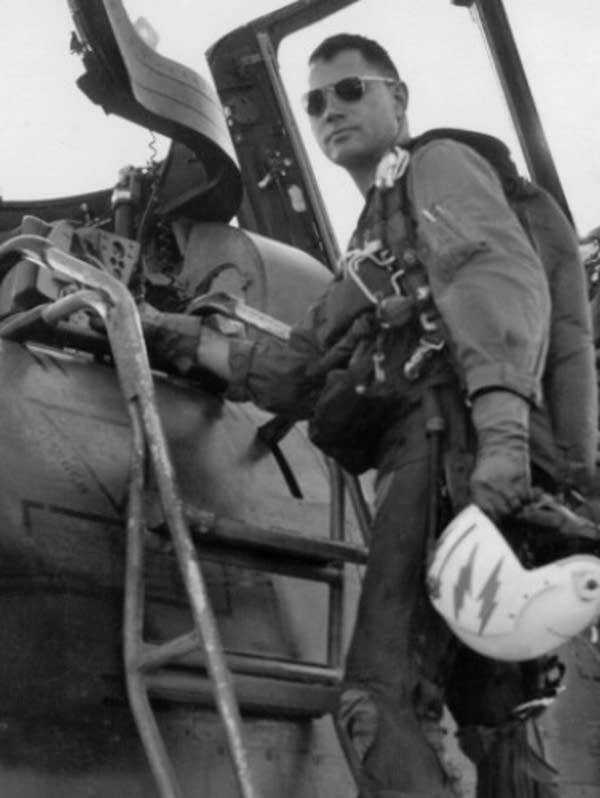 Those basic values gave Thorsness a stick to the job approach which helped make him one of the best -known combat pilots of the Vietnam War. His commitment was evident during his Medal of Honor mission on April 19, 1967. Thorsness was flying an F-105 fighter over North Vietnam. It was a tense day. "Damn, damn damn," says an Air Force pilot. That voice is from a tape recording of the actual ground-to-air communications of the flight that earned Thorsness the Medal of Honor. The 40-year-old recording still conveys the danger and urgency of the day. Thorsness was attacking surface-to-air missile sites, or SAMs. With him in the backseat of the warplane was Harry Johnson, an electronics warfare officer. Johnson tracked ground radar signals and other electronic clues useful in detecting missiles. At one point Johnson reported that enemy fighter planes, MiGs, were attacking. "Trying to get pictures, Harry," says Thorsness. "We got a MiG, low, nine o'clock, over the road, coming in low, Leo, right down there nine o'clock," says Johnson. "Have at him, there he is. There he is going right under us, right now. See him?" Thorsness shot down one plane and likely two that day. He also destroyed several SAM missile sites. During the attacks anti-aircraft fire took down a second plane flying with Thorsness. The crew parachuted. Thorsness provided cover, circling the downed pilots. "There's two SAM, Leo -- one at 10 and one at nine," says Johnson. They evaded the missiles, planes and anti-aircraft fire. Running low on fuel Thorsness refused to leave the downed crew, who in the end were captured. Out of ammunition, he lured some enemy planes away from U.S. rescue aircraft. Dropping down to treetop level, Thorsness outran the MiGs by accelerating to more than 900 miles an hour. "That's very exciting to be zipping along at about 20 or 30 feet supersonic," says Thorsness. "It's kind of a blur, kind of a blur." Before leaving for home Thorsness made certain more U.S. planes were on the way. He concluded his transmission with "I'm out of the area, out of fuel." "Do you still have all of your airplanes airborne? ", asks Thorsness. "I'm out of the area, out of fuel." "Roger, we got them out, all four, are way up this time, Leo, " says the air controller. Thorsness headed for an airborne refueling tanker over Laos. But when he learned another plane also was low on fuel, he let that pilot gas up instead. With a nearly empty tank, Thorsness took his plane up to 35,000 feet. With the engine on idle, he glided the last 70 miles home to a U.S. airbase in Thailand. "That's as euphoric as I've ever felt," says Thorsness. "It was just a phenomenal challenge. You're aware that you may end up dead or a prisoner." Thorsness had little time to reflect on the day. The demands of war soon had him back in the sky. For the time being, what would become his Medal of Honor flight was filed away as just another mission. Eleven days later, on April 30, 1967, a MiG fighter hit his plane with a missile. "They pulled their nose up, two MiGs, and they hosed off their Atoll which is a copy of our Sidewinder air-to-air missile. My wingman and I, both of us took an Atoll right up our tailpipe, didn't have a chance," says Thorsness. When he ejected the plane was going so fast the windstream bent his legs sideways severely injuring both knees. He was captured and spent the next 6 years as a prisoner of war in the notorious "Hanoi Hilton." Torture was common. POWs were beaten with rubber hoses and fan belts. Some were hung upside down. Others were bent double so their heads were between their legs. Thorsness says this produced dislocated shoulders and sometimes broken backs. "Being tortured is just horrendously painful," says Thorsness. "It's hard to believe how inhumane one person can be to another." In the U.S. the Vietnam War was becoming increasingly unpopular. Thorsness says the POWs were tortured until they signed statements condemning U.S. policy. Even with the draconian living conditions, the POWs managed to communicate. They developed a simple tap code. Take Thorsness' initials. "L" is three taps, pause, then one tap. "T" is four and four. It was through the tap code that Thorsness learned he'd been nominated for the Medal of Honor. The nomination traveled up the military command chain, eventually reaching the secretary of defense, then the president. Thorsness says at the time, the medal seemed like insignificant news. The torture, deprivation and separation of POW life was so intense it overshadowed everything, even news of the nation's most significant military award. But better days were ahead. On January 23, 1973, President Richard Nixon announced a Vietnam peace settlement. It included the release of all U.S. prisoners of war. 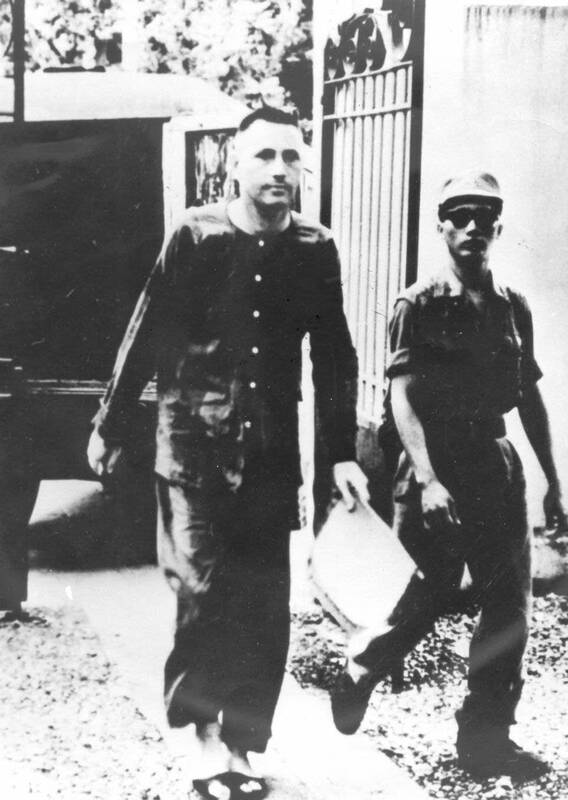 When their captors told the POWs the news, they refused to celebrate, fearing a trick. Thorsness finally got out in early March, still doubting to the end that he would actually be freed. 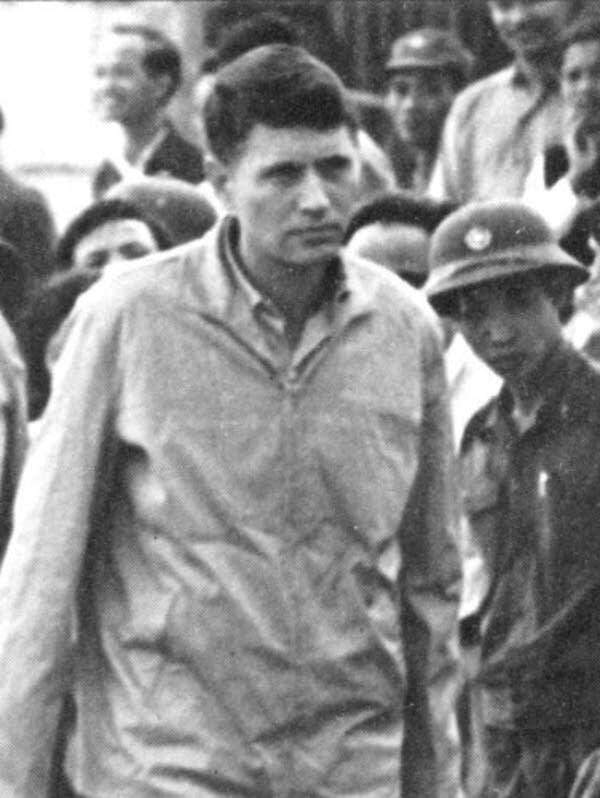 U.S. officers and medical personnel came to North Vietnam to take the POWs home. "The best-looking nurses in the world escorted us out to the 141," says Thorsness. "There was still no emotion. We got on. And when the airplane broke ground, headed for the Philippines, that's when the emotion let loose. Everybody was cheering; it was just a phenomenal experience." The return of the POWs was a national event. Even a minor illness seemed newsworthy. Walter Cronkite mentioned Thorsness on his CBS newscast. "Fifty-six more American former prisoners of war headed home today from Clark Air Base, the Philippines. And one of them, Air Force Lt. Col. Leo Thorsness was sidetracked in Honolulu by fever and a sore throat. Taken from the plane and hospitalized, his condition was said to be good," said Cronkite. 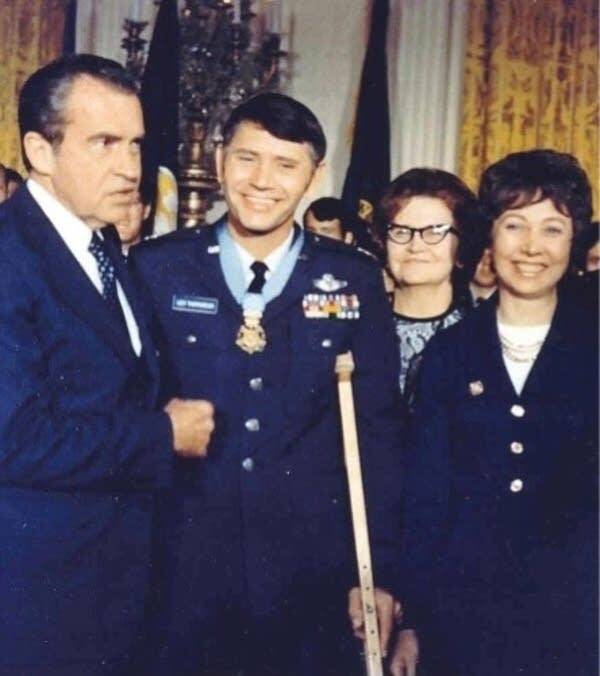 Seven months later, Thorsness received the Medal of Honor at the White House. The official citation says "On April 19, 1967 Thorsness demonstrated extraordinary heroism, self-sacrifice and personal bravery." "You can ask any Medal of Honor recipient today and everyone of us will tell you just in different words but we'll say, 'You know there's a whole bunch of people out there that are as or more deserving than we. There was nobody there to do the research, everybody got killed, there were no eyewitnesses, it fell through the cracks'. Those of us who have the Medal of Honor, we wear that for those who can't," says Thorsness. After the war Thorsness entered a civilian life of business and politics. Living in South Dakota, he lost a U.S. Senate race to George McGovern in 1974. In 1978 he lost an extremely close House race to Tom Daschle. In the 1980s he was elected to the Washington state Senate. He lives now in Arizona. 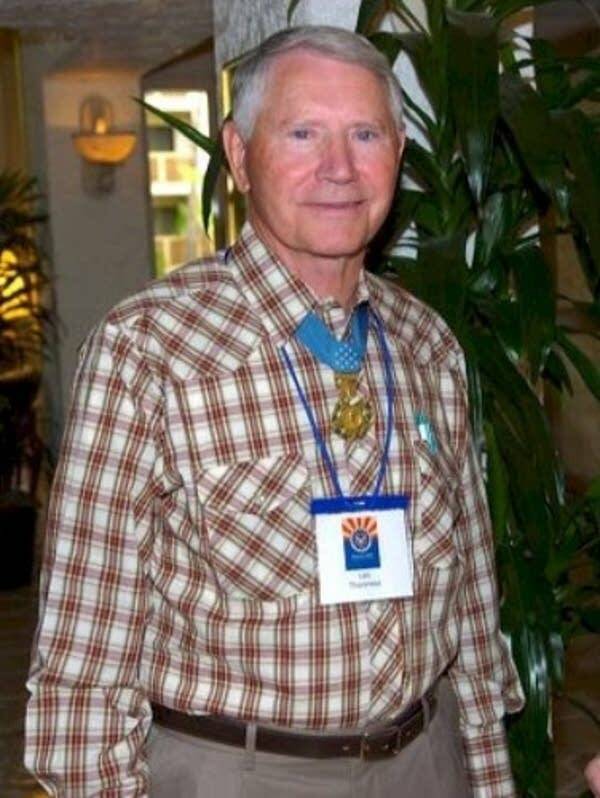 His Medal of Honor and POW time keep him in demand as a speaker, often at military events. He does it all with a smile. He says since being released from prison 34 years ago there hasn't been a single bad day in his life. The ground to air communications of Thorsness Medal of Honor mission was recorded and is posted at this link.